Conor McGregor avenged his loss to Nate Diaz as he edged the American by majority decision following five hard-fought rounds in Las Vegas. The foes traded shots throughout the course of a main-event that became an instant classic, with both withering, but neither willing to give in during the main event of UFC 202. Two judges scored it in favour of the Notorious one, while the third deemed the fight a draw. It capped off a sensational night of fights in the capital of the sport; with the temperature raised on a warm August night in Nevada that featured a blistering knockout by Anthony Johnson, more amazement from Donald Cerrone, and more. 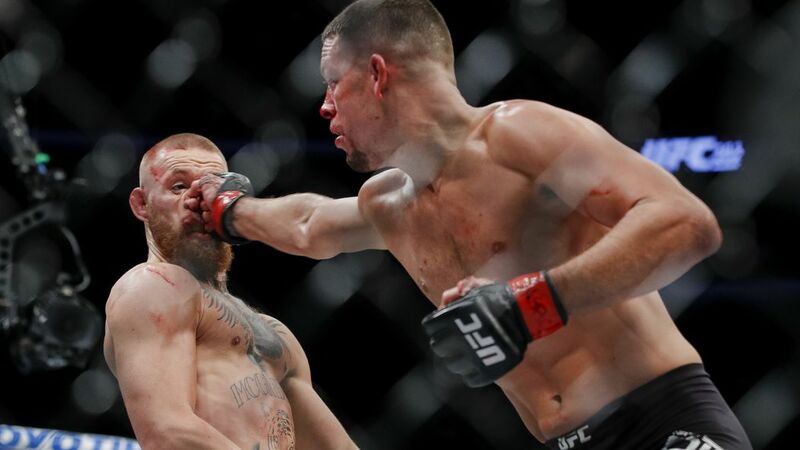 Conor McGregor settled the score in his grudging rivalry with Nate Diaz as the Irishman won a thrilling majority decision victory on an instant fight-of-the-year contender in the main event. Right off the bat, the Notorious one landed a hard leg kick and it soon appeared that would be a primary aspect of his game plan. Continuing to knock away at the lead leg, Nate Diaz was getting very bothered by the damage he was taking, before McGregor was able to land upstairs with a clean straight left that wobbled Diaz, followed by another which sent him down to the canvas. His danger was still present though, with McGregor deciding not to follow him to the mat due to the gulf in jiu-jitsu abilities. With the legs of the American still wobbling, the Featherweight champion continued to pursue the strikes. Leg kick after leg kick, the Stockton-based fighter's balance deteriorated which contributed to another knockdown for McGregor, sending a straight left down the pipe taking him off balance. Another one would follow suit, as his game plan was working wonders - pursuing his opponent at a conservative pace with damaging leg kicks and peppering some tough shots. 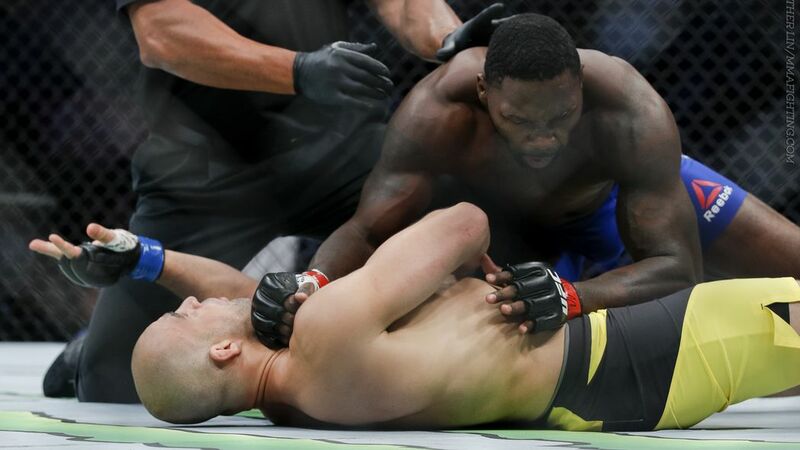 However, midway through the second round and Diaz would come on strong, almost déjà vu as the Notorious began to slow down, with his shoulders sagging as he looked drained circling and running to find space and a rest bite. McGregor would stumble back to the fence as Nate found more success with the jab and hook, before he did further damage inside close quarters. He finished the round strongly and really made things a contest going into the third. Still looking tired after the war being waged, Conor was on the outside as Diaz continued to press knowing that the fight could have been his for the taking. The left hands were still coming though, until once again Nate pressed him up against the cage and did even more significant damage than ever. The big lefts and leg kicks did come between the grappling, as did an exhibition of solid takedown defence - but Diaz would have his opponent on the verge of a finish as he pummelled him with nowhere to go. Hooks coming out from the left and right were landing, as the Irishman tried to regain his bearings, slipping and keeping his hands up. The ending of the third round was a lifeline for McGregor. Continuing to make it physical, further grappling up against the fence created further problems, although takedowns wouldn't be on of them. Returning big elbows in the clinch, along with a solid Diaz left hand painted a picture of beautiful chaos; and more was still to come. Suddenly, rather tan looking drained, McGregor found a new lease of life, doing excellently back in the centre of the Octagon and striking range. Further takedown attempts in the final round did not not come together until a big twist to hurl him towards the floor in the final seconds. Over the course of the fifth round, McGregor uncharacteristically circled, literally turning his back on Diaz at some times to check the clock. 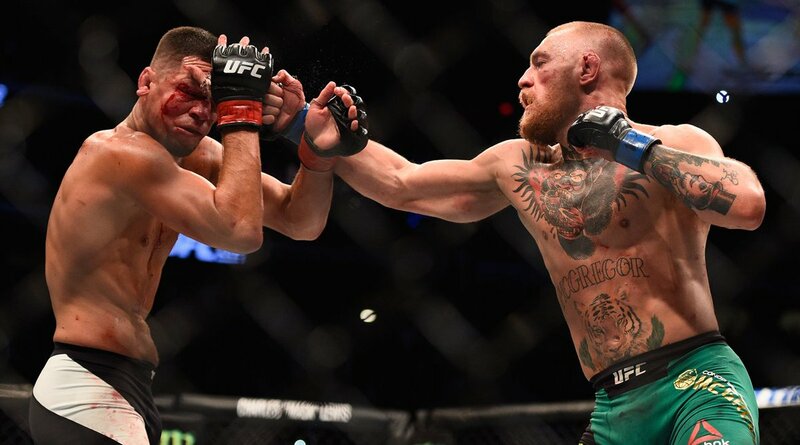 When things were back in the clinch, more tough elbows were landed - and in the takedown, Diaz would land again, but couldn't take out McGregor, with the American helping his opponent up to his feet in a sign of mutual respect after their thriller. Conor McGregor was given the win based on the opinions of two judges who claimed a 48-47 victory, suggesting 10-9s throughout while the other tied it at 47 apiece. With a close ending, the talk of doing it for a third time came up right away. McGregor expressed intent to complete the trilogy at 155 lbs, while Diaz didn't comply but seemed interested - there are still a few chapters to be written in the feud and if this fight is anything to go by, they will be good ones. A highly touted light heavyweight matchup between two of the division's hardest hitters ended inside 13 seconds as Anthony "Rumble" Johnson flattened Glover Teixeira with a thunderous uppercut on the first exchange. The Brazilian unusually decided to opt the tactic of applying pressure on his opponent, but was soon caught for it. While he was unfazed by the stiff shot he received coming in, Johnson soon found a gap in the guard to pop a killer uppercut that folded Teixeira, following up with some ground and pound as he was well and truly out of it. Post-fight, "Rumble" he acknowledged the professional behaviour of his vanquished opponent on a week where that was all brought into question after the press conference melee. The previous title contender also added that he has paved a path to be the next contender as well, against the man who submitted him back in May last year, Daniel Cormier. Following that performance, his case is as strong as they come at 205 lbs. Donald Cerrone's rejuvenation in the welterweight division rolled on like an unforgiving steam train as he dispatched Rick Story with a stoppage due to strikes in the second round. "Cowboy" added yet more skills to his game with lightning fast combinations, adding kicks to keep the wrestler at bay. After attempting a takedown in the first to really exemplify his skills and a submission attempt, Story was resembling a bewildered man after strikes upon strikes landed on his chin. 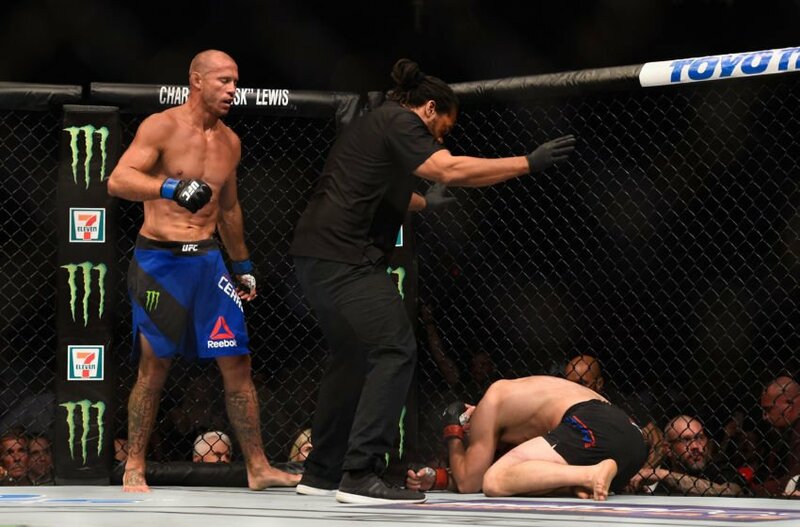 A sensational punch combination finished with a glorious head kick put Story down - and subsequently out, as Cerrone once again showed how good he can be. While the bout was contested in the welterweight division, the veteran did have a lot of interest invested in the realms below where he had done most of his work, lightweight, and more specifically so champion Eddie Alvarez. Whichever destination is next, the opponent is in for a tough ride, as the "Cowboy" rides on and adds elements to his game time after time. Hyun Gyu Lim's return to the Octagon ended in devastating fashion as Mike Perry dropped him on three occasions in the first round, with the final one the most crucial as he overturned the early pressure and sent him into all new levels of disorientation. While the South Korean was able to recover from the bottom, the third time he got dropped left him no chance of stepping back onto the canvas. Tim Means spectacularly kicked off the main card action with a dominant pummelling of promotional newcomer Sabah Homasi en route to a second-round stoppage. "Dirty Bird" opened his opponent up with piercing elbows, leading to a prolonged period of pressure as his compatriot went on the back foot. As the fight wore on, the blood would be painted all over the face of Homasi, and after many times in which he looked rocked, a couple of clean punches is all that the referee needed to bring the fight to a halt. Cody Gabrandt set his eyes on the bantamweight prize after a blistering stoppage over Takeya Mizugaki. The Alpha Male fighter preserved his record and looks to be next in line to challenge Dominick Cruz.